Beginning Monday, June 15, 2009, Jamba Juice will begin serving a range of food items in most of their California stores. To promote this announcement, Jamba Juice flew me (and some other bloggers) out to their headquarters in San Francisco to taste their new menu. My first question was answered quickly, upon arrival. Jamba Juice is not turning their stores into a healthy version of, say, Subway. Jamba’s fast food is not prepared on-site. 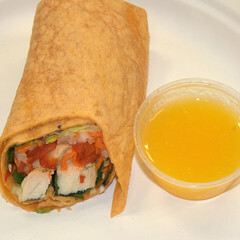 The wraps, salads, pizzas and sandwich, although created by Jamba Juice in their test kitchen, are produced by their supplier(s) according to their specifications. All but the pizzas will be prepackaged and available in a refridgerated case. 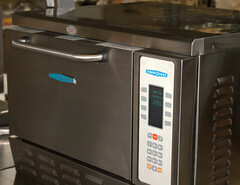 The pizzas are delivered frozen to Jamba Juice locations and are heated, in store, in a TurboChef oven. Jamba's staff told us that these menu offerings are all about the taste and they want them to live up to the expectations their customers have for their flavorful drinks. They also want their customers to feel the wholesomeness of their food. One goal in creating their foods was to limit saturated fats. Jamba Juice tested these foods ("very quietly") in six of their stores. On Monday they will be available in 222 of their California locations. The Grab and Go menu includes Wraps, Salads and a Sandwich. To compliment the new food menu, Jamba is introducing 3 Fruit Tea Infusions. In line with Jamba's focus on healthy and nutritions beverages, all their new food menu items have no HFCS (high fructose corn syrup), no trans fats, and no artificial flavors or preservatives. Bravo! Unfortunately, they have not yet made an effort to buy local, organic produce or hormone and antibiotic free chicken. Other chains, like Chipotle, have made efforts in this area, but not many. However, with Jamba's history of commitment to health and nutrition, I would hope this is something they would pursue in the future. Jamba's Grab and Go selections will be promoted as a "Cubicle Picnic." They'll be sold in a paper bag printed with directions for making your own Cubicle Picnic and even include a poster of an exotic location you can pin up in your cubicle to make for an imaginary escape from work. You'll also be able to create a video to send to your boss, spouse, or parents telling them you need some bliss at the web site www.SummerBlissIsBack.com. You can post the video on your Facebook account. Notes: Clicking on any photos in this post will take you to the Flickr photo page for that photo, where you can view it larger. I took all the photos during my visit to Jamba Juice headquarters. Food descriptions in "quotes" are the descriptions supplied by Jamba Juice. "Grilled chicken breast with fresh field greens, shredded carrots and jicama wrapped in a tomato tortilla, served with mango vinaigrette on the side." Wrap with sauce: 430 calories, 7 grams fat, 0 saturated fats. "Grilled chipotle-lime chicken breast with fresh field greens and sweet corn wrapped in an herbed tortilla, served with chimichurri sauce on the side." 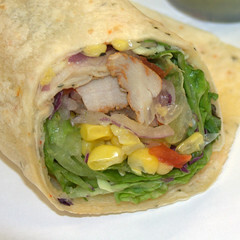 Wrap with sauce: 560 calories, 25 grams of fat, 2.5 grams saturated fats. "Red quinoa and hummus with fresh field greens wrapped in a spinach tortilla served with mango vinaigrette on the side." 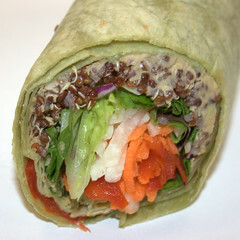 This wrap qualifies as vegetarian and vegan (no animal products whatsoever). 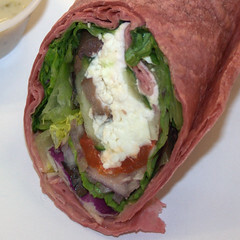 Wrap with sauce: 640 calories, 14 grams fat, 1.5 grams saturated fats. "Feta cheese, chopped kalamata olives and fresh field greens wrapped in a beet tortilla, served with Greek vinaigrette on the side." This wrap is vegetarian. 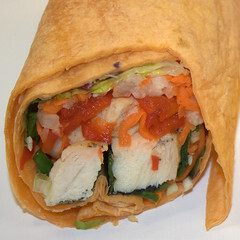 Wrap with sauce: 550 calories, 26 grams of fat, 4 grams saturated fats. These are all cold wraps, pre-packaged with a container of their respective sauce (the sauce is under the label in the packaging shown above). They'll be on display in a refidgerated case in the Jamba Juice locations that carry them. My favorite, even though I'm not a Vegetarian, muchless a vegan, was the Greens and Grain Wrap. It had a great variety of textures (including crunchy veggies) and flavors. They were all flavorful though. The sauces were great, but it might be nice if you could pick your own sauce seperately. Jamba has 2 salads in their Grab and Go case, they are both priced at $5.50. 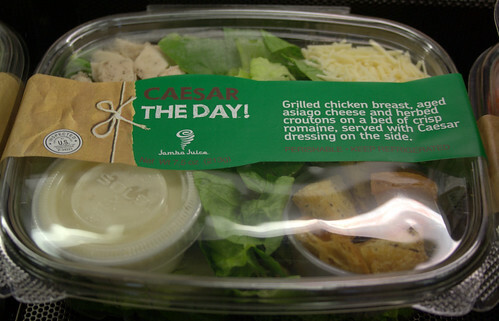 "Grilled chicken breast, aged asiago cheese and herbed croutons on a bed of crisp romaine, served with Caesar dressing on the side." It's a Caesar salad with chicken, what can I say. Salad with dressing: 330 calories, 22 grams fat, 4.5 grams saturated fats. and the "Couscous & Produce"
This was, by far, the most unique menu item from Jamba Juice. I tasted all these items in a short period of time, so I'd like to taste this one again, alone, but it was certainly unique. The most distinctive characteristic of this 'salad' was the sweetness from the currants. 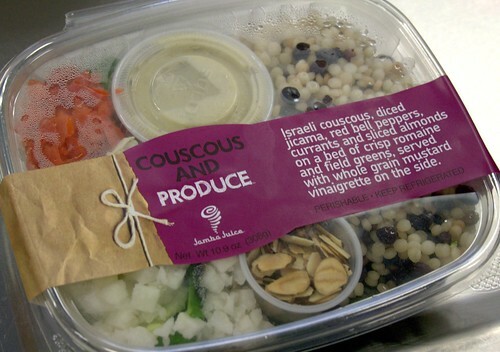 Jamba's description: "Israeli couscous, diced jicama, red bell peppers, currants, and sliced almonds on a bed of crisp romaine and field greens, served with whole grain mustard dressing on the side." Salad with dressing: 480 calories, 19 grams fat, 1 gram saturated fat. This item is vegetarian. As the Jamba R&D team mentioned, it would be vegan, too, if it wasn't for the honey used in the dressing. Poor bees. 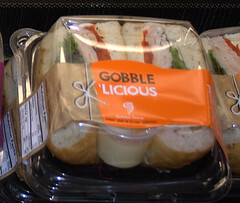 There is also a sandwich in the Grab and Go case, the "Gobble'licious." This is what I ate on the plane, flying home from San Francisco. Hey, it's a Turkey sandwich! Perfect plane food. And this brings up an interesting point... Jamba Juice will not be offering these foods at all their locations. Some locations, they said, are to small to handle the addition of the refridgerated case. Unfortunately, this includes their airport locations. All the items above would be PERFECT to grab and eat on a flight. They are all much better than the pre-packaged food options I've been finding at the airport. Hopefully they'll find a way to include them at their airport locations eventually. 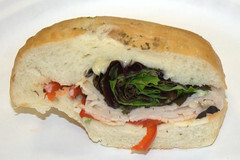 Back to the Gobble'licious: "Sliced roasted turkey breast topped with provolone cheese, field greens, sliced red bell peppers on a focaccetta roll, served with dijonnaise on the side." Sandwich with dijonnaise: 570 calories, 28 grams fat, 5 grams saturated fat. 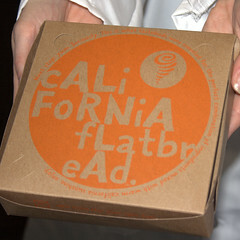 Jamba Juice will also be selling what they call "California Flatbreads." They are little, 5-inch pizza's. There are 4 varieties and they are frozen in-store until you order, at which point they are cooked (in under a minute) in a TurboChef C3 oven. After they are heated they are served in a box. The pizzas are priced at $3.50 to $3.75. 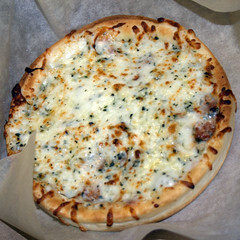 "A thick and crispy crust topped with tomato-basil sauce and a classic Italian four cheese blend (mozzarella, provolone, parmesan, and romano.)" It is vegetarian. This was my favorite pizza. But hey, I love cheese. 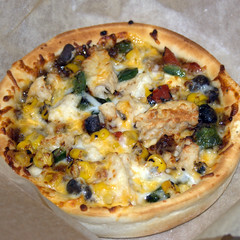 "A thick and crispy crust topped with BBQ chicken, smokehouse roasted sweet corn, black beans, poblano chilies, red bell peppers, and a combination of mozzarella and cheddar cheeses." This was the most unique of the 'flatbreads.' Those are bread crumbs on top. I wasn't a huge fan, but it certainly was a unique flavor for a pizza. 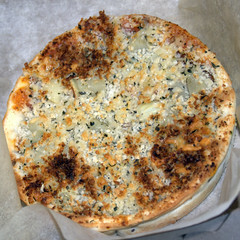 From Jamba: "A crispy flaxseed crust topped with perfectly seasoned tomato sauce, diced artichoke hearts, a blend of three cheeses (asiago, romano, parmesan), and crunchy breadcrumbs." It is vegetarian. 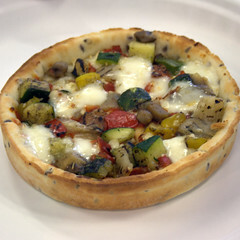 "A crispy flaxseed crust topped with Mediterranean-style grilled zucchini, onions, bell peppers, mushrooms, and a combination of feta and mozzarella cheeses." It is vegetarian. I liked this one a lot, too. Again, probably because it was so cheesey! 250 calories, 8 grams fat, 2.5 grams saturated fat. $3.75. The pizzas, excuse me, California Flatbreads, were unique and tasty. I come from St. Louis where a pizza crust is always crisp, so I would have liked it if these mini-pizzas had a crispier crust. Despite Jamba's official descriptions, these did not have a crispy crust on the bottom. A truly crisp crust is hard to accomplish going from frozen to hot and ready to serve in seconds in a convection/microwave oven. To compliment their new foods, Jamba Juice is also introducing a line of "Fruit Tea Infusions" on Monday. This makes sense. 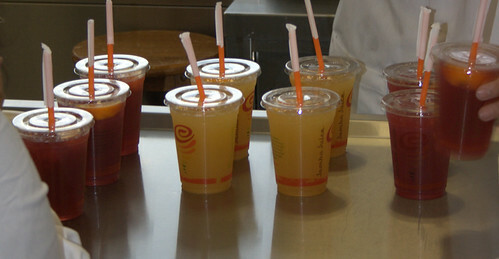 Many of Jamba's drinks would be too filling to go along with a wrap or pizza. All these fruit teas are less than 160 calories in the the 16 oz. size. And they are all very tasty and refreshing. They are: Pomegranate Tea Infusion, Passion Fruit Tea Infusion, and Prickly Pear Tea Infusion. They are an infusion of organic green tea with one of the fruit juices above, served over crushed ice with a splash of lemonade and garnished with an orange wedge. I'm not a huge fan of tea, but with the fruit infusion and the lemonade I loved these. Unlike the food, but like Jamba's other beverages, these drinks are mixed in the store. 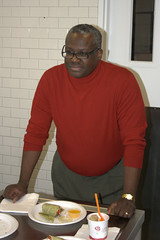 James D. White, President and CEO of Jamba, Inc., was on hand in the Jamba Juice test kitchen during our visit. This soft-spoken, amiable man has only been at the helm of Jamba since December of 2008 and this is the first major addition to Jamba's line-up during his tenure. James: "For many years Jamba Juice has been popularized as the nation's leading smoothie chain. And although we have introduced baked goods, snacks and most recently oatmeal to the menu, we felt that Jamba Juice was ready for a dramatic transformation. With the addition of food and cold teas, we are able to give our customers what they really want -- tasty, high quality foods that are quick and easy." Some of the other bloggers invited to Jamba Juice for the tasting were Abby from Pleasure Palate, Mari at Secrets of a Kitchen Wizard, Bear Silber for GrubGrade, Jessica for Epic Portions, Taylor at FoodBeast, Leng from Fat Cat Who Created a Vegetarian, Stephanie from Wasabimon, Carol from Uncovering Food and Denise from Denise Does Dessert. How fun, that's my fantastic brother Rand in the video. Hope you had fun hanging out with him. Thanks for the link to my blog, but can you remove my name from the post? Wow gross! Looks like the best from a broke, regional airport! Processed goodness! No, SOGGY, processed goodness! I like that they've got a vegan option. And glad it tastes so great.